IPSS are popular in different fields of transport, mainly for personal use (car-sharing, bike-sharing). Their usage in urban goods transport is not still generalized but those systems present a good potential. 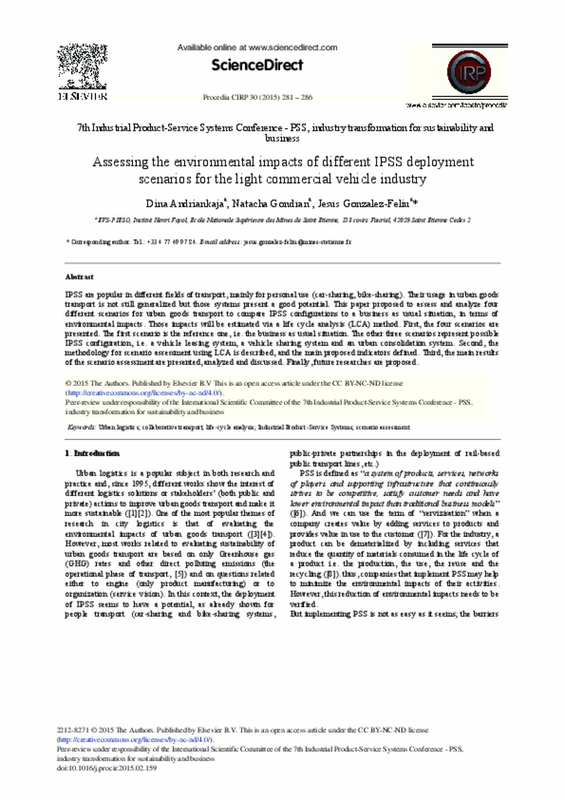 This paper proposed to assess and analyze four different scenarios for urban goods transport to compare IPSS configurations to a business as usual situation, in terms of environmental impacts. Those impacts will be estimated via a life cycle analysis (LCA) method. First, the four scenarios are presented. The first scenario is the reference one, i.e. the business as usual situation. The other three scenarios represent possible IPSS configuration, i.e. a vehicle leasing system, a vehicle sharing system and an urban consolidation system. Second, the methodology for scenario assessment using LCA is described, and the main proposed indicators defined. Third, the main results of the scenario assessment are presented, analyzed and discussed. Finally, future researches are proposed.